1) Eslabón Perdido, Poseidón, Rey Infierno ?? Kid Lobo, Samuray, Vengador Jr.
scheduled as a Villano 3 Jr. & La Hiedra vs Big Mami & Nino Hamburugesa, but Nino Hamburugesa was missing (!?!) and Bengala changed it (???) to a three way. Villano III & Bengala fought by themslves and Big Mami got the Splash win. 7) Dr. Wagner Jr., Hijo del Fantasma, Psycho Clown DQ Hernandez, Rey Escorpión, Texano Jr.
Not exactly sure when this will air. It’s the next taping after the current Juarez one finishes next week, but they have a break coming up soon. Normal order has it 12/16 and 12/23, but they might go into the usual 3 weeks best of programming on 12/16 (& 12/23 & 12/30) instead. Faby going ruda is probably for the best for the match up with Shani, though it’s going to be hard to get a Mexico City crowd to root against her. AAA’s been careful about not adding anyone new to Los Perros del Mal after Perro passed away, likely feeling there’d be some backlash to doing that. Some of the advantage to bringing back an Ayako Hamada or Mr. Aguila is adding to that group with already endorsed members. They could always have Kahn create an offshoot group, so the new guys are adjacent to but not actually part of Perros del Mal. If they actually make them part of the group, I wonder if there will be some backlash, or if people have moved or if all of this so under the radar that no one will really care. AAA also knew for weeks that Ayako was in Japan and wouldn’t be making this show, but didn’t feel the need to announce a change that wouldn’t have hurt ticket sales at all. Rudos took 1/3, using the ropes to win. Starman & Signo continued to feud. No title change is no big surprise. Main event is actually going somewhere. Might not be the only one. Starman won fall 1 over Raziel, Starman was DQed for unmasking Raziel in the second, rudos were DQed for unmasking Fiero. More unmasking followed between the six luchadors who had been feuding. Johnny Idol is going to be turning on his teams for a while. CMLL’s not added anyone new to the (not yet announced) 12/25 Infierno en el Ring match, it’s still those same six guys. They’ve done six man cage matches before, but with much bigger names. The rap battle seems like it drew pretty well, and it was a good idea to move this show for a night. Arena Coliseo might have a longer future if CMLL can rent out their other arena for events. The Crash in Ecatepec also looks like it did very well, maybe a sell out. I’ll go over those results, DTU, IWRG and NGX tomorrow. Mexican channel Space announced they’ll be debuting a new lucha libre drama, “La Ultima Caida“. It’ll be a 10 episode series, focusing on fathers and sons in wrestling. No air date is mentioned. It’ll be taped in Mexico City and Queretaro. One of the stars is Arnulfo Reyes, who was the henchman Checo in the Blue Demon series. AAA has this week’s TV show up. Lucha Sorpresa has some recent lucha recommendations. DoradaFan has highlights of 11/14 & 11/17 CMLL. Segunda Caida reviews Solar & Super Astro vs Black Terry & Virus. Don’t do the middle rope spot, Mephisto. Third time is not the charm, CMLL can’t afford a broken Volador. Microstars are back, at the site of the one rudo win. Look, Johnny Idol is a tecnico again. Caristico & Mistico are enemies on Friday, friends on Sunday. I’ve been so successful in phasing out the Sunday Guadalajara stuff that no one noticed or cared, but it’s back because so is Triton. He’d said all along he’d be back in Mexico in December, it is December, e is back in Mexico. No idea if he’s staying, and it doesn’t look like he’s on the main CMLL roster yet. It’s my second favorite moment of things that are maybe not actually responses to something I’ve written but sure feel like it, right behind AAA posting a video on Twitch saying they were coming back to that service “really soon”. I’m sure they have that intention, but a lucha promotion (or other lucha service) saying “really soon” just triggers me at this point. I’ve been told “really soon” by so many people about so many things – “we’re getting TV really soon”, “we’re going to make it easy to get merchandise really soon”, “it’s all going to be on a video service to make it easy to watch really soon” – and none of it happens. The only thing that happens is some time goes by and I hear “really soon” again. I’m sure it’s never meant as a lie, but it feels like 85% of “really soon” lines turn out to be just that sort of false promise, and one that no one involved in telling seems as disappointed by telling. It’s great AAA wants to be back on Twitch, but give me a date and give me a explanation if doesn’t happen, don’t waste any one’s time with a “really soon” that can’t be trusted. This is a #hottake that no one’s going to read because it’s way down here, but The Crash is foolish if that’s the actual card order. It’s not a match quality issue. This is a statement about who the company actually sees as it’s bigger stars: the Lucha Brothers, or a part time Demon, a one time Metal and M-Ximo. The main is the Demon match because 20 years of Demon matches have talked people into believing he should be in the main event. That’s in the best interest of Blue Demon, but not in the best interest of the promotion. Mima Shimoda makes her debut, and Trevor Lee is back. He’s not particularly listed as a Impact wrestler, so I wonder if this is on his own and not the continuation of the angle they ran in Tijuana to set up a title match with Daga. It’s one of those things I haven’t written about because it’s tough to find a way to write about nothing happening, but all the Impact stuff in Mexico – with The Crash and with AAA – seems to have gone cold . Impact is still taping stuff with other promotions. I wonder if it was just an expense issue, since everyone from these groups are still were being used on Impact’s own TV. “The Crash” logo is big on the poster, but it looks like it might be someone else may actually be promoting this one. Whatever the deal is, it’s an interesting card. 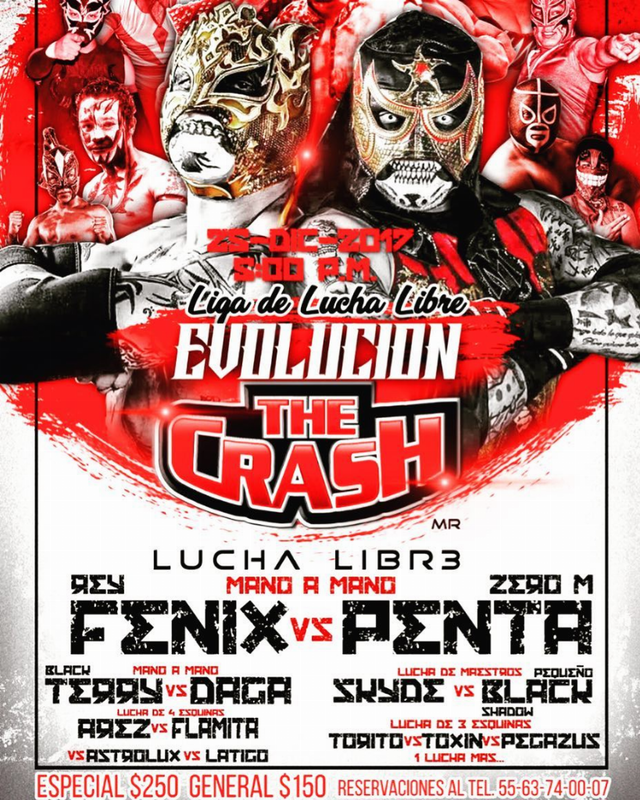 One of my favorite things to bring up on the podcast is how Fenix and Penta have never had a singles match in Mexico. Whoever’s behind this show is finally killing that meme dead. They may kill each other dead too. someone tape this show for Powerbomb.TV or Highspots thank you.